Some government and private organizations are interested in improving services for lesbian, gay, bisexual, transgender, and questioning (LGBTQ) youth who run away from home or experience homelessness. These efforts are prompted, in part, by research suggesting LGBTQ youth may be at greater risk for experiencing homelessness and, if they become homeless, more likely than their heterosexual counterparts to experience victimization, engage in high-risk sexual behaviors, and have poor mental health. To better understand provider experiences serving LGBTQ runaway and homeless youth (RHY), the Office of the Assistant Secretary for Planning and Evaluation (ASPE) of the U.S. Department of Health and Human Services (HHS), in collaboration with the Office of Planning, Research and Evaluation (OPRE) in HHS’s Administration for Children and Families (ACF), sponsored case studies of four local agencies receiving grants from ACF’s RHY Program. 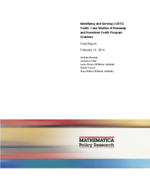 The purpose of the study, conducted by Mathematica and its subcontractor, the Williams Institute, was to learn about programs’ strategies for identifying and serving LGBTQ RHY, the challenges programs face in understanding and addressing the needs of this population, and potential areas for future research. The four study sites are federally funded RHY programs that provide a range of services, operate in different regions of the country, and have experience serving LGBTQ youth. They include agencies with urban and rural service areas in Colorado, Minnesota, Ohio, and Texas. One agency receives RHY Program funding for basic center services, two for transitional living, and two for street outreach. The share of clients identified as LGBTQ ranges from 5 to 28 percent. Drawing on site visit interviews as well as reviews of agency documents and forms, this report presents findings on four topics: (1) agencies’ collection and use of data on clients’ sexual orientation and gender identity, (2) providers’ assessment and perceptions of needs and capacities among LGBTQ RHY, (3) providers’ approaches to serving LGBTQ RHY, and (4) providers’ perceptions of research gaps and data needs related to services for LGBTQ RHY. We conclude by suggesting issues for policymakers and practitioners to consider related to collecting data on, and serving, this population. Agency staff conduct assessments during initial intake sessions and subsequent meetings with youth to determine immediate needs, detail personal circumstances, and identify risk factors or barriers that may need to be addressed through longer-term services. Assessment tools used by some agencies inquire about sexual orientation and gender identity, but no agencies reported using tools that specifically target LGBTQ youth. Some staff reported that they assess needs or circumstances related to LGBTQ identity based on their own knowledge of these issues and techniques for exploring them with clients. Many staff felt that homeless youth face similar types of risks, regardless of sexual orientation and gender identity. Nevertheless, some types of risks—emotional distress and poor mental health, substance abuse and sexual risk behavior, and problems with family and personal relationships—were perceived to be particularly salient or frequent among LGBTQ youth. According to staff reports, LGBTQ youth of color and transgender youth are at the highest risk of encountering barriers to accessing appropriate services or resources, especially those related to health and employment. Staff also perceived some distinctive protective factors among LGBTQ youth. In particular, LGBTQ youth may be “survivors” who develop positive self-protection skills after experiencing stigma and rejection. All agencies visited implement some organizational strategies that focus on LGBTQ youth, including adopting nondiscrimination and nonharassment policies and protecting the confidentiality of information shared by youth. Agencies differ in the extent to which they have implemented other organizational strategies, such as establishing a safe and affirming environment, developing staff skills in serving LGBTQ youth, and creating partnerships with other organizations serving LGBTQ youth. Opportunities to improve cultural competency in serving LGBTQ youth ranged from annual trainings on site in two agencies to occasional attendance at sessions offered at universities or conferences for staff at another agency. Agencies also tailor a variety of services to make them more accessible or relevant to the needs and circumstances of LGBTQ youth. For example, agencies tailored housing programs to the needs of LGBTQ youth by assigning shared accommodations based on self-reported gender identity and providing private accommodations, when available, to address youths’ concerns about safety. These approaches were perceived to be especially helpful for transgender youth who could be concerned about sleeping in male or female dormitories. Two agencies offered services specifically for LGBTQ youth. One agency employs an LGBTQ case manager who develops individual service plans for LGBTQ-identified youth in its housing programs. Another operates a host home program specifically for LGBTQ youth, matching these youth with LGBTQ-supportive adults who offer youth transitional housing in private homes. Staff in two agencies reported that they aim to facilitate reconciliation between LGBTQ youth and families when possible, but that such assistance is offered only to the extent a youth wishes to engage with her or his family. Agency staff did not report that efforts at family acceptance for LGBTQ youth are based on a formal intervention model. Rather, staff use general mediation strategies in their attempts to work with families. Two factors that appear to affect tailoring of services to LGBTQ youth are the presence of staff with LGBTQ expertise and the perceived proportion of youth served who identify as LGBTQ. Having staff with appropriate expertise and a visible LGBTQ clientele may encourage agencies to take steps to better serve this population. Challenges that can impede efforts to improve or tailor services for LGBTQ RHY include (1) a lack of local resources that focus on LGBTQ youth; (2) the difficulty of overcoming social stigma, especially toward LGBTQ youth of color and transgender or gender-nonconforming youth; and (3) staff concerns about singling out a specific population of RHY while still being able to help all youth who need an agency’s services. Size of the LGBTQ RHY population in local areas. According to agency staff, community-level data on the number of RHY who identify as LGBTQ would help agencies understand whether they are reaching this population successfully. These data also may help them gauge whether current services align with the characteristics of the local RHY population. Characteristics of subpopulations of LGBTQ youth. Staff perceived transgender youth (including transgender youth of color) and LGBTQ RHY of color in general to be at particularly high risk of poor outcomes, but little is known about the proportion of the RHY population these youth comprise, the specific risk factors prevalent among them, or their outcomes. Risk and protective factors among LGBTQ RHY. Staff members pointed to three risk factors that appear to be prevalent among LGBTQ RHY and could be better understood: (1) types and severity of mental health disorders, (2) prevalence and factors contributing to human trafficking and sexual exploitation, and (3) prevalence of intimate partner and dating violence among LGBTQ RHY. According to staff, experiences among LGBTQ youth also have the potential to support development of protective factors or personal capacities. In particular, resiliency among LGBTQ homeless youth may increase as they learn to contend with discrimination. Factors contributing to LGBTQ youth homelessness. Additional research on the reasons LGBTQ youth become homeless would help providers identify and address the potentially varied and distinct factors contributing to this problem. Experiences of LGBTQ youth involved in multiple systems. Homeless youth may be involved in several public systems, especially the juvenile justice and child welfare systems. Staff in case study agencies indicated a need for information on the perceptions of these systems among LGBTQ RHY and efforts to link across systems to better serve this population. Service models and administrative strategies that focus on LGBTQ RHY. Agency staff frequently expressed a need for intervention models targeting LGBTQ RHY and information on the effectiveness of these interventions in various service contexts (for example, urban or rural areas). Staff mentioned a particular interest in models for promoting family engagement and reunification and positive youth development among LGBTQ youth.